How do we stretch every donated dollar into three meals for hungry Marylanders? With the help of volunteers like you. There are many ways for volunteers to help at the Maryland Food Bank. You can sign up to assist in warehouses, kitchens, offices, farms, markets, or live events. 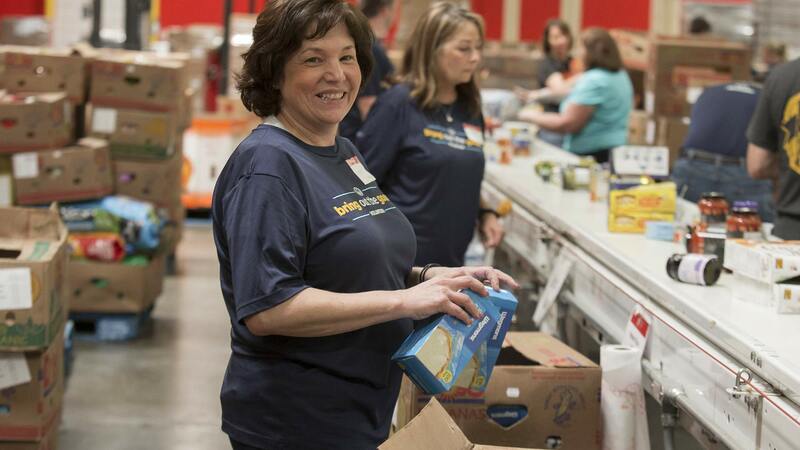 Whether you’re sorting food, harvesting crops, flash-freezing healthy meals in our Charles T. Bauer Community Kitchen, or serving as a nutrition ambassador, Maryland Food Bank volunteers make a big impact in the lives of hungry Marylanders. Sort and check the expiration dates of donated food on our conveyor belt, pack boxes, and create meal kits. Volunteers must be at least 18 years old (14-year-olds are welcome on nights and weekends), able to lift 25 pounds, and stand for three hours. You can volunteer as an individual or a group (5-20 volunteers). Help prepare ingredients and package meals for distribution across the state. Volunteers must be at least 12 years old, able to lift 25 pounds, and able to stand for three hours. You can volunteer as an individual or a group (5-10 volunteers). Build your resume and use your office skills to help with filing, data entry, and special projects like donor mailings in Baltimore. Sort and check the expiration dates of donated food on our conveyor belt, pack boxes, and create meal kits. Volunteers under the age of 16 must be accompanied by a chaperone. All volunteers must be able to lift 25 pounds and stand for three hours. You can volunteer as an individual or a group (5-20 volunteers). Build your resume and use your office skills to help with filing, data entry, and special projects like donor mailings. 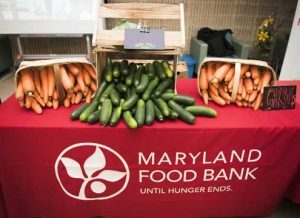 This Maryland Food Bank program helps get more local produce to more Marylanders. Pick fresh fruits & vegetables at partner farms across the state. There are no age or physical restrictions to participate. Volunteer as an individual or organize a group (5-20 volunteers). Learn more about the program, including locations. Our Healthy Eats Are Really Tasty (HEART) Market program combines fresh produce and staple groceries with music, education, and demonstrations at schools across the state. Volunteers help set up the market, distribute food, and clean up after the event. You must be at least 14 years old, be able to lift 40 pounds. and stand for 3 hours. Volunteer as an individual or group (5-10 volunteers). Learn more about scheduled events and locations. All volunteers must wear closed-toed shoes and should bring a jacket or sweatshirt. The minimum age to volunteer varies depending on the activity. Check the shift descriptions for specific requirements. All volunteers under the age of 18 must be accompanied by a chaperone who is at least 21 years old. There must be at least one chaperone for every five youth volunteers. Physical requirements vary by activity, so check the shift descriptions. However, at a minimum, volunteers must be able to stand for up to the three hours and lift up to 25 pounds. Volunteers who arrive more than 30 minutes after the start of their shift will be asked to reschedule. We’re always happy to help get volunteers the info they need. How can I see which of my group members have signed up? Click on the shift you wish to check. Click the “Registered Users” button. This will show you the name and group affiliation of everyone registered in that shift, including those not in your group. It will also show you how many spots you have reserved. Why does the system say there are only X number of slots available in my shift when I reserved more than X? This message refers to spots available to volunteers without a reservation. Your spots are reserved. How do I reserve additional spots? Email volunteer@mdfoodbank.org with any requests to change your reservation and we will make every effort to accommodate your request. Be sure to include your group name, the date/time/location of your visit, and details of the desired change. How do I cancel my group’s reservation? To cancel a group reservation, email volunteer@mdfoodbank.org. Be sure to include your group name and the date/time/location of your visit. Absent extenuating circumstances, canceling a group reservation with less than one-week notice will jeopardize your group’s ability to volunteer with us in the future. How do I cancel my personal reservation? You will receive an email confirming your personal cancellation. A member of our group is recovering from an injury. Can they still volunteer? For their safety, we require that each volunteer be able to stand for three hours, lift 25 pounds, read labels, and take direction from staff. While we appreciate their desire to support our mission, we cannot accommodate volunteers who do not meet these requirements. Please email volunteer@mdfoodbank.org if any members of your group have special needs. Can a group member’s child volunteer with us? Volunteers under the age of 18 must be accompanied by a chaperone who agrees to supervise the youth volunteers. Chaperones must be at least 21 years old. Each chaperone may supervise up to five youth volunteers. Youth that do not have enough chaperones will not be allowed to participate. In Baltimore, youth ages 12 and older may volunteer in our kitchen. Youth ages 14 and older may volunteer in our warehouse on Saturdays and evenings. Volunteers must be 18 years old to help in the warehouse during the day on weekdays. 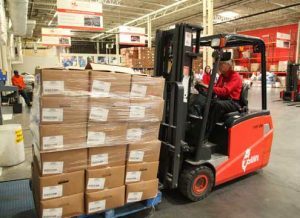 In Hagerstown, youth ages 16 and older may volunteer in the warehouse. 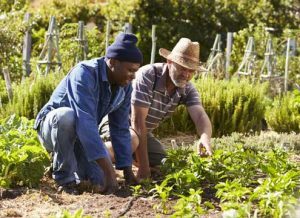 Our Farm-to-Food Bank program does not have a minimum age to volunteer. A member of my group needs to arrive late. Can they still participate? While we appreciate their desire to help, we cannot accommodate volunteers who arrive more than 30 minutes after the scheduled start time. Can my group have lunch at the Food Bank before/after our shift? Groups volunteering at our Baltimore location can reserve our boardroom, subject to availability, from 12:00 to 1:00 pm. Please send a room request to volunteer@mdfoodbank.org. Past groups recommend Seasons Pizza or sandwiches from The Lunch Box Lady. We also offer a full catering menu through our FoodWorks program. You will receive an email notification if there is a closing or delayed opening. 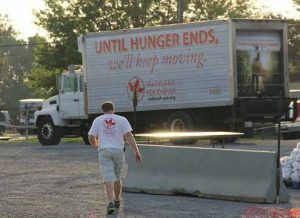 You can also visit mdfoodbank.org or tune in to WBAL TV or check wbaltv.com for updates. What should my volunteers wear? For safety reasons, all volunteers must wear closed toes shoes. In addition, the temperature in our facility fluctuates so we suggest they bring a light jacket or sweatshirt. Please allow plenty of time for traffic so you arrive at least 15 minutes before the start of your shift. Our staff and other volunteers will be waiting for you, so please be courteous and considerate of their time. We cannot accommodate volunteers who arrive more than 30 minutes after the scheduled start time. Take a look at what it means to be a volunteer at the Maryland Food Bank. Ready to lend a hand?